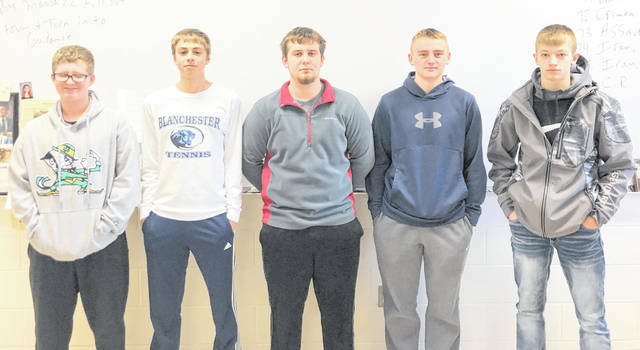 The Blanchester High School tennis team, from left to right, Bryce Bandow, Colton Wilson, Cody McCollister, Ian Heeg. Team members Brian Miller, Hunter Miller and Logan Heitzman were not present for the photo. With the top two singles players returning, Blanchester High School tennis should be in good shape this season to defend its SBAAC National Division crown. But head coach Scott Shepard, in his 20th season at BHS, says it’s not a slam dunk for his Wildcats to repeat. Jacob Miller and Hunter Miller return as the 1-2 punch at the top of the lineup. Both are seniors and were first team All-SBAAC all-stars a season ago. Cody McCollister and Brian Miller also return to lead the BHS doubles pairings along with Colton Wilson and Ian Heeg. Shepard said the team lost two starters from a year ago, with Jordan Stroud, William Rannells and Josh Casteel graduating and Clayton Schirmer and Tanner Kellerman choosing to run track and field. Newcomers for Blanchester are freshmen Bryce Bandow and Billy Knapp. Shepard is being assisted for the fourth season by Reilly Hopkins.